An abused, trapped woman is gifted to an mc Sargent in arms. Both with seriously screwed up histories. Bit of an ott storyline but the true story is the struggle to work out who they are together. A great read. Not just Hot in parts but also has a storyline. With all the hype with this book on social media, I was really looking forward to reading this book. But I'm sad to say I was once again disappointed with another SC book. After reading her last mafia books I thought I would like another one of her full-length books, but not this one. With Ugly Beast I was actually rather angry with how his character was written. He ran hot and cold so much that I actually felt sorry for Abriana. Then when he decides to do an about face and finally come to terms with his "feelings" for her she's already been taken and beaten. I also didn't like that although we had a female who was constantly (and I mean constantly repeated throughout this book) told she was ugly or plain, Ugly never made mention to try and make her feel any different until the very end. He even went so far as to mention she was even plain...not the kind of hero I like. I think the only saving grace with Ugly was that he didn't sleep with any other woman once he was married. However, he did let the club "women" touch and dance on him, there was never any reciprocation on his part. My only complaint on the writing of this book, there is one point after Abriana's dad comes to the house and attacks her. After she gives Ugly the phone she walks upstairs and goes to a closet to fall asleep. However, in the following scene, Ugly goes upstairs to make sure she is okay and all of a sudden she's on the bed...This was an annoying jump. 2) I HATED how often people commented negatively about the heroine. Plain, bland, not a beauty, wasn't gorgeous, weak, ugly, she'd never be a looker... over & over & over AGAIN. Enough already. GAH! 3) Not sure I bought Ugly Beast's confessions of truly wanting to be with Abriana at the end. They just didn't seem genuine. Call me #disappointed with this one but there's always the next read! 5.0 out of 5 starsOH WOW!!! The twists and turns in this book! The plot and characters will keep the reader's attention and interest. Ugly Beast is a force to be reckoned with and more. Abriana and Ugly Beast are a rare and unique couple 💑. 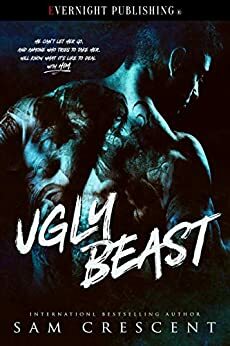 The story of Ugly Beast and Abriana will hold the reader throughout this novel. Give a read. Enjoyable.